Legend has it The Upper Room Mission was started by a sheriff, a barber and a widow. Well, that story is about one-third the truth. Here’s how it all really began. 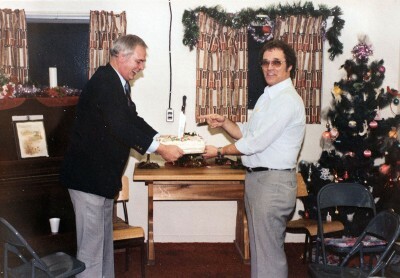 IN 1980, RON MORGAN WAS A SHERIFF IN VERNON. He spent most of his days driving prisoners back and forth to jail in Kamloops along the Okanagan Highway. During those trips, Ron and the prisoner would often get to talking. “How did you get into trouble?” Ron would ask. And he’d listen to their stories. Alone in the car late at night or early in the morning, Ron wondered, ‘Lord, is there something we can do to relieve people’s pain?’ Soon, the idea of a place where these people could be fed and clothed came to him. Founder Ron Morgan (right) cuts a cake at Christmas in the Mission’s first location above ‘the old radio station. A few weeks later, Ron was viewing the space where ‘the old radio station’ was above what was then the Simpson Sears building (now the HSBC building on 30th Ave). The rooms were soundproofed for radio and the rent was a staggering $800 a month. “I’ll take it,” Ron said, of the upper room. And so The Upper Room Mission, now one of the oldest Vernon charities, was born. Ron started feeding Vernon’s hungry with just a hot plate and a bag of porridge. No fridge. No kettle. Not even a dime. “We had nothing.” Nothing but faith. So, before his shifts, at 6 a.m., Ron would put on porridge and open the door. “We put the word out: Anyone who is hungry, come.” And so, they came. So too did the volunteers, including Gordie McClure, Pat Zonnveld, Bob Conneton, Yvonne Bonin and Bev Henke. Soon, The Upper Room Mission was feeding dozens, and not just breakfast, but also lunch—big pots of soup and sandwiches made with ground pickles, onions and meat ends from meat markets. The Mission moved down the street, to a space on Coldstream Avenue behind Home Hardware with a bigger kitchen, a chapel area for prayer meetings and bible studies, and a section for clothing to be sold to keep the lights on. A woman affectionately named ‘Granny’ (left) ran the first dollar bin thrift store across the street from the Mission’s former Coldstream Avenue location. 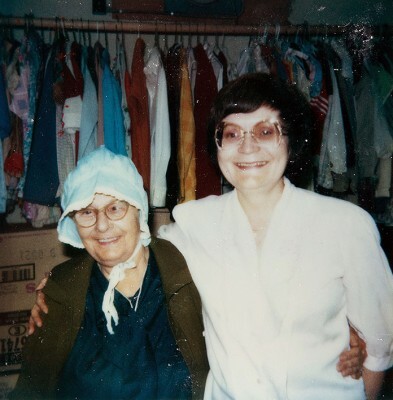 A woman known as Granny ran a second thrift store across the street with 10 and 25-cent items piled in bins. They held Christmas pageants and gave gifts—socks and sweets. They had their share of characters—a man named Chief, a woman named Charlotte. They continued to clothe and feed and minister. The food and money came, from old ladies with a fistful of pennies, and butchers with bones. It always came. And it was a family. People helping people. 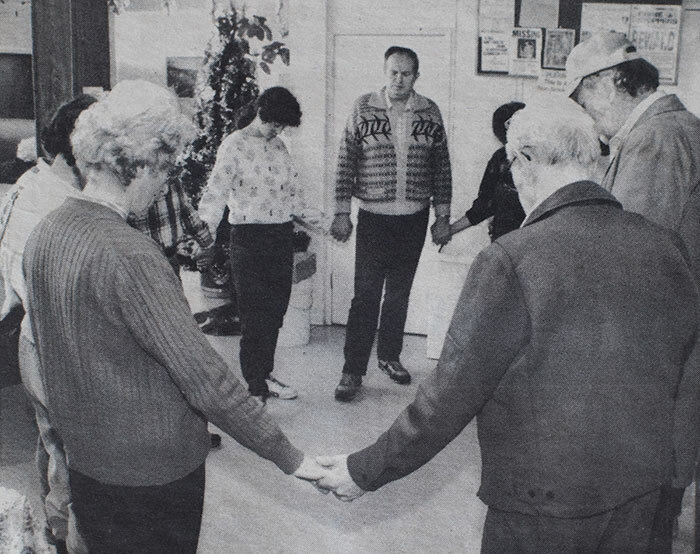 In 1989, with a large donation left by a community member in hand, the Mission moved to an old tire factory on 27 Avenue, its third and present location. 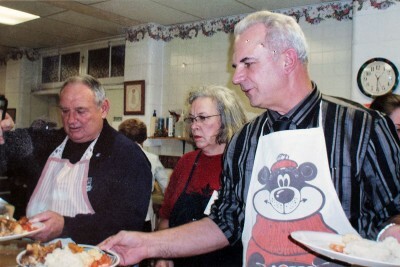 Prayer meetings and fellowship breakfasts were an important part of the Mission’s beginnings. Over the next 26 years, leaders would come and go, The Boutique would move into its own building next door, and outreach services would give guests more ways to access help and overcome challenges. The vision that fuelled the Mission’s early days would always carry on. In the mid-night hours of December 1, 2014, a pipe broke. The whole place flooded. Just weeks before Christmas, one of the busiest and coldest times of year, the Mission had to close The Kitchen. Over the next 12 weeks, the community banded together: businesses donated food and construction supplies, people volunteered to serve, guests helped clean up. From muddy waters and chaos came many helping hands from the community that always rallies behind us, and now we have a sound, beautiful building to continue feeding people in all the ways they’re hungry for years to come.